One of my plants - actually several plants - that desperately needed my attention this January was the rosemary. There were two plants living in a bed in the vegetable garden. They had suffered damage in the last year and had several dead parts. Two more plants lived in large planters and had really outgrown their space. They all needed some grooming and a new home. Today, I set about giving them what they needed. The two plants that lived in the vegetable garden are the survivors of my longest-lived rosemary. I don't even remember how long I have had these plants but it has been many, many years. They used to grow in another bed in the vegetable garden, but about ten years ago, I dug the mass planting that actually consisted of three plants, and moved them to a 4'X4' bed. They had thrived there for many years, reaching a height of more than three feet and filling the bed, but last summer, I noticed they were beginning to look raggedy. A few weeks ago, I walked by the bed and realized that the plant in the middle was completely dead and there were dead branches on the other two. An examination did not reveal any insect damage or obvious disease. I think the problem was purely cultural and perhaps I had ignored signs of stress for too long. I had already dug out and disposed of the dead plant and today I cut all the dead branches from the other two plants. Thus cleaned up, they actually looked pretty good and appeared to be healthy. The other two plants were in good condition and required little attention other than a lot of muscle to wrestle them out of their pots. I then took all the plants to their new home. The planting bed where they are now ensconced is an 8'X4' bed. It has a small 'Red Cascade' rose at one end. Now the rosemary fills about two-thirds of the bed. I plan to put some edging plants around the perimeter of the bed, but I'm still debating on just what that should be. I enjoy growing herbs and rosemary is one of my favorites. In that regard, I am one of millions for it is arguably the best loved herb in the world. Much of its popularity is due to the wealth of traditions that are associated with it. It has had many uses both as a culinary and a medicinal herb. But rosemary and remembrance had been linked long before Shakespeare's time. Ancient Greeks had worn it as a garland to stimulate the brain and the memory. Because of these associations, it was also used as a symbol of fidelity for lovers and was often included in wedding bouquets and bridal wreaths. Moreover, it was used as a symbol for remembrance of the beloved dead for the same reasons. In addition to these uses, rosemary was long thought to be efficacious in the sickroom and is still used by some practitioners of traditional folk medicine in this way. It is sometimes burned to dispel the evil humors that infect the body. But it is as a culinary herb that rosemary has seen its greatest popularity. It is a wonderful accompaniment to meat dishes. Pork, lamb, and beef can all benefit from its addition, and it adds a lovely flavor to roast chicken. Too, just a touch of rosemary can make many sauces tastier. I also like to use it in "Cheesy Herb Biscuits." 1/2-3/4 c. chopped herbs (any combination you like but parsley, rosemary, chives, and dill are good) Use less if using dried herbs. Mix the herbs and cheese with the dry biscuit mix. Add milk and mix. Drop by spoonful onto an ungreased cookie sheet. Bake at 450 degrees for 8-10 minutes or until golden brown. Makes 1 dozen large biscuits or 30 small ones. This recipe is a great snack and sometimes I've even had it as a meal by itself. It is also good as the bread accompaniment to a more traditional meal. Give it a try. I think you'll like it. It might even help your memory! At the beginning of this week, I had big plans about all that I would accomplish in the garden in the next seven days. Well, the sixth day is history and most of my big plans are unfulfilled. What with one thing and another, events and the weather intervened to screw things up for me. Sometimes it seems that that is the story of my life. Frustration, thou art the gardener's middle name. Most of what I had hoped to accomplish involved putting in some new beds on the south side of the house and working on getting stones laid in the sitting area under my red oak tree. It wasn't a total washout because I did get the turf removed from the area where I'm installing the new bed along the side of the house, and DH (Dauntless Hubby) did spend one day working on the sitting area, removing some roots that were in the way, but the rest will just have to wait for us. The weather is looking a bit more promising for tomorrow, so maybe I can recoup part of my plans then. Meantime, the weather is what woke me Friday morning at 4:00. A loud clap of thunder that sounded like it exploded right outside my window was followed by rain pounding the roof. I listened for quite some time before I managed to drift off to dreamland again. When I got up later and checked my rain gauge, I found that we had gotten two-and-a-half inches of rain during the night. Even though the rain let up after daybreak, it was too wet and muddy to do much work outside. A bit chilly, too. Fortunately, the weather forecast for this weekend seems to have ameliorated a bit. That big freeze that was being forecast early in the week has gone away. The predictors now say it should get down to 32 here tonight, which means that it will probably be a bit colder than that in my backyard. Still, that's much better than the 20s that were predicted earlier. In the time that I did get to spend in the garden this week, I was dismayed to see that more damage from the January freeze continues to rear its ugly head. Some oleanders that I thought would be okay now look like burnt toast, although they may still come back from the roots. My bougainvilleas and split-leaf philodrendons sustained more damage than I had thought, although they, too, may still come back given time. On the other hand, while examining the bed where my agapanthus lives, I was heartened to see the green tips of new growth pushing up through the mushy damaged leaves. In other chores around the garden this week, I did manage to get some mulching of beds completed, a little more pruning of woody shrubs, and a bit more clean-up here and there, but, all in all, I have to admit I'm feeling a bit frustrated and cranky about my week so far. All I can say is, that sun better come out tomorrow! I've just about used up my repertoire of alternative winter gardening activities, things like perusing seed catalogs, poring over garden books, and planning new garden projects. Enough already! I want to get outside and get my hands dirty. Still on most days recently, it has been just a bit too chilly outside or else the ground is too wet or else it is actually raining. So even on days when I can't get my hands into the dirt, I've taken to wandering around the garden searching for signs that winter is beginning to wind down and getting ready to relinquish its hold on my plants and me to its gentler sister, spring. I've found a handful of those signs. A few days ago, I encountered a butterfly in the garden. All summer and fall, the garden was full of butterflies of many different varieties, but since our freezing weather started, I hadn't seen any except for the infrequent yellow sulphur visitor. This was not one of those, however. It was a Question Mark butterfly. A little research revealed that these butterflies are actually active here in winter, retreating to a hiding place on cold days, so you might not accept this as a sign of spring coming. Still, I found it very heartening to see a butterfly in the garden once again. Earlier this week on a beautiful and pleasant day full of sunshine, I found an even more substantial sign of a changing season. As I was walking past the long-idle outside unit of the air-conditioner, I happened to glance that way and saw a green anole spread-eagled on the metal that had been warmed by the sun, taking in its rays. He looked so happy, if indeed an anole can look happy, that I just had to laugh. I hadn't seen any of these little guys since our most recent freeze, so I saluted him and passed on by, leaving him to his sunbath. In another part of the yard, I was giving my old apple tree the once over when I noticed its swelling buds. It looked as though it's just waiting for some secret signal to begin opening those buds to the eager pollinators. While I was looking at the tree, I met one of the pollinators. There was a honeybee, buzzing about the limbs, perhaps hopeful that some of the buds had already opened. He buzzed my face, but I assured him I had no pollen or nectar and pointed him over to the corner of the yard where a few more blueberry blossoms have opened prematurely, yet another sign of spring just over the horizon. Examination of some of the woody shrubs turned up more swelling buds. The hydrangeas, the viburnum, and the azaleas all appear to be preparing for that time a few weeks from now when they will begin filling my world with a color other than brown once again. If any more proof is needed, there is the song of the cardinal. Yes, he is singing his spring song once again - what-cheer, what-cheer, what-cheer. "Hold on," he seems to say. "Spring is coming!" I've been pruning like mad this week. 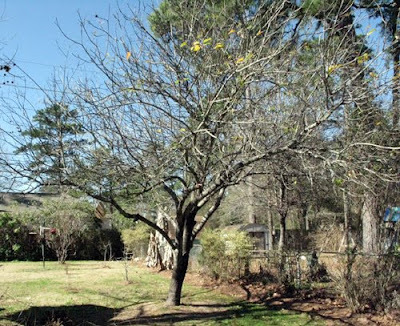 It's late January, after all, and, here in Southeast Texas, it's time or past time when the grapevines and other fruit trees and shrubs need to be pruned. The grapevines were most critical so I decided to start with them. If you wait to start pruning until dormancy begins to break in the grapevines, you risk damaging the vines. In fact, it is possible for the vines to actually "bleed" to death as their sap leaks away through the cuts. So I was anxious to get this particular job completed. The vines grow rampantly each year and, no matter how much we cut them back in the winter, by the end of the growing season, they are a tangled mess once again. It took me several hours - I admit I do take long breaks - and three successive sets of cuts to get the vines back to just the trunks and a few leaders. By next December, they'll be the same tangled mess all over again. And speaking of tangled messes, the old Ein Shemer apple tree fit that description well, too. We took out a couple of low hanging limbs and some criss-crossing limbs. Then with the hand pruners, I removed all the little "sprouts" that I could reach to open up the limbs at the center of the tree so that more sunlight could get in. For Christmas, I had gotten my husband a mason bee habitat constructed of bamboo tubes. (I knew he wanted one but, unaccountably, he forgot to put it on it on his list!) I hung the bee habitat in the apple tree. This tree attracts bees by the hundreds when it blooms, so they should have no trouble finding their new quarters. After we finished with the apple tree, I moved on to the anisacanthus wrightii (flame acanthus). This willowy, blowsy shrub is a rampant grower, not unlike the grapevines. I always cut it back hard in the winter and then I usually have to cut it back again, semi-hard, during the growing season to keep it from getting completely out of hand. When I say "it," you can multiply that by about ten, because I have a long row of these shrubs along my veggie garden fence. During much of the year, they are full of their tubular orange blossoms and colorful butterflies and hummingbirds. But right now they are just brown sticks like most everything else in my yard. Underneath all that brown, though, they are still green and totally undamaged by the freezes. I thought about waiting awhile to prune them, but this is the time of the year when I usually do this chore, and even if we do have another freeze and some tender growth gets nipped, it's not going to permanently hurt these guys. They are tough. And so I wielded my sharp blades and reduced their height by about half. On to the hamelia patens (hummingbird bush). My hamelias die back to the ground each winter, so in January every year, I cut them back to just inches above the ground. Then as things begin to warm up, they grow back from the roots. By the end of the growing season, they are 6 - 8 feet tall again. But before I tackled the hamelias, I decided to give myself a treat and make a run to the nursery for something in bloom. I decided to stop at Lowe's since it was closest, and they had a lot of their stuff on sale because it was freeze-damaged. I picked up some nice violas, kalanchoes, snapdragons, and heucheras and took them home with me where I spent the rest of the afternoon happily digging in the dirt and planting my treasures. Yes, pruning is wonderful therapy, a great way to get out all that aggression. But once you've gotten rid of that negative energy, it is nice to reward yourself with the gentler, more positive therapy of colorful blossoms. Looking at all those pretty blooms made me feel ten years younger and ten pounds lighter. Positive therapy, indeed! "I think that I shall never see a poem lovely as a tree," the poet Joyce Kilmer wrote just before he went off to serve in World War I, where his life ended. His poem lives on, and no one has ever better described the mystical hold of trees on the human psyche. At all seasons of the year, trees have a kind of beauty and poetry and majesty of their own. In mid-winter, as at every season, they are the anchors of the garden. 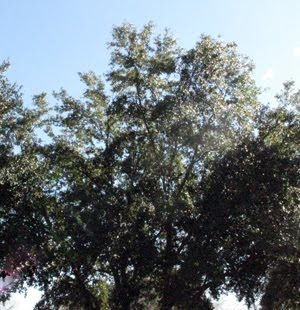 Live oaks, of course, are much the same at all seasons. They never get fully undressed, although they do shed their old leaves in spring as new leaves are being produced. 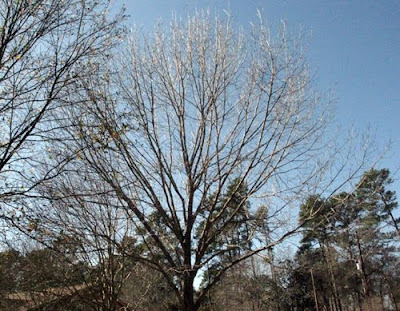 In winter, their leaves offer shelter and santuary for birds who need a safe haven from predators or from the weather. 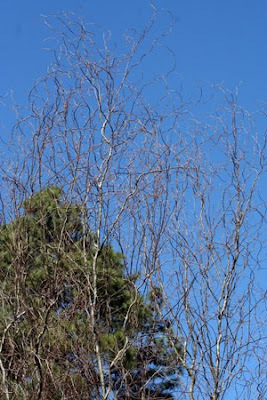 The same can be said of the magnolia trees, a favorite roosting place for many birds in winter. The bottle tree never loses its "leaves" either - but I haven't noticed any birds roosting there. 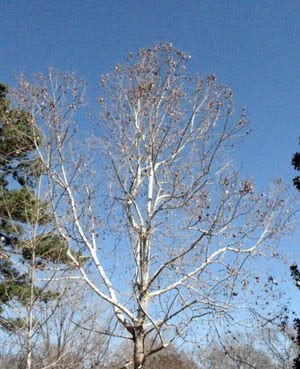 The sycamore hangs on to a few of its leaves until they are finally displaced by new leaves in the spring. Every passing breeze brings a shower of sycamore seeds cascading down from the plentiful seed balls. These seeds are favorite winter food of many birds including the goldfinches who spend hours each day picking them out. The apple tree, too, keeps back a few of its old leaves even as it prepares to open its swelling buds to the bees in late winter. The corkscrew willow gives it all up, every leaf, and stands naked against the winter sky and the background of the neighbor's pine trees that tower over everything. The twisted limbs and twigs of the willow give some extra interest to the winter garden. Last summer, I learned that its leaves are hosts to some species of butterflies and moths. I knew there was a reason why I liked it. 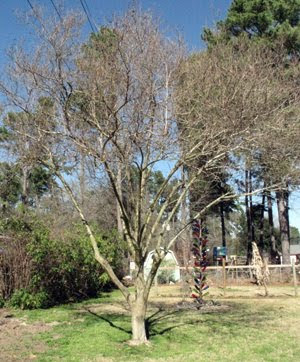 The old crape myrtle was planted many years ago by birds, and it still feeds birds in winter with its seeds. The upright limbs of the Shumard red oak seem to be lifted to the sky in praise and exultation. None of these trees is old, as trees go. Except for the magnolia and the crape myrtle, we planted them all, but all of them, except for the willow, are now more than twenty years old. 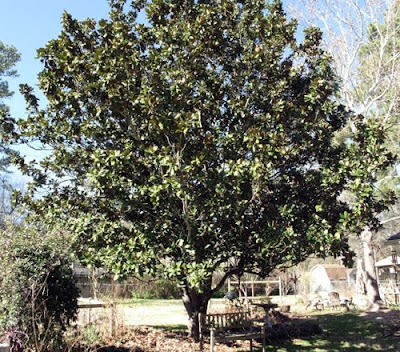 They have stood in our yard through drought and flood, heat and cold, and hurricane winds and they have been undaunted. Their leaves have shaken with our laughter, and in times of sadness, they have given me strength and consolation. They've always been there for me to lean on. They are friends to me. I think that I shall never see a poem lovely as my trees.